The male was back on 18th March, just two days later than the previous year and the female was back on 20th March for the second year in succession. During the evening of 3rd April the female remained hunkered down in the nest throughout the night. It was suspected that she had laid an egg, but it was not until 10:02am the following morning that an egg was able to be confirmed. Continued high winds led to the pair building up the sides of the egg cup to such an extent that three eggs could not be seen until 11th April. However, it is believed the second egg was laid on 6th April and third egg on 9th April. The first chick hatched on 11th May, the second arrived the next day and the third on 14th May. They were fitted with their rings on 18th June, Blue 80 a male, Blue 0C a female and Blue 1C another male. Blue 80 fledged on 4th July, followed by Blue 0C on the 5th and Blue 1C on the 7th July. They had all left the area by the first few days of September. In the middle of July came the announcement that the RSPB had taken the decision to pull out of the running of the project and hand the management of it over to the local community to run. Bywyd Gwyllt Glaslyn Wildlife was consequently formed by volunteers and interested parties to protect the ospreys and show people the ospreys and the other wildlife in the valley. Also during 2012 the Dyfi nest successfully fledged another male chick, although two young chicks had died earlier in the season due to the exceptionally heavy rainfall that fell in early June in the area. At a nest platform in Snowdonia monitored by Friends of the Ospreys, an un-ringed pair of ospreys also successfully fledged a male chick. 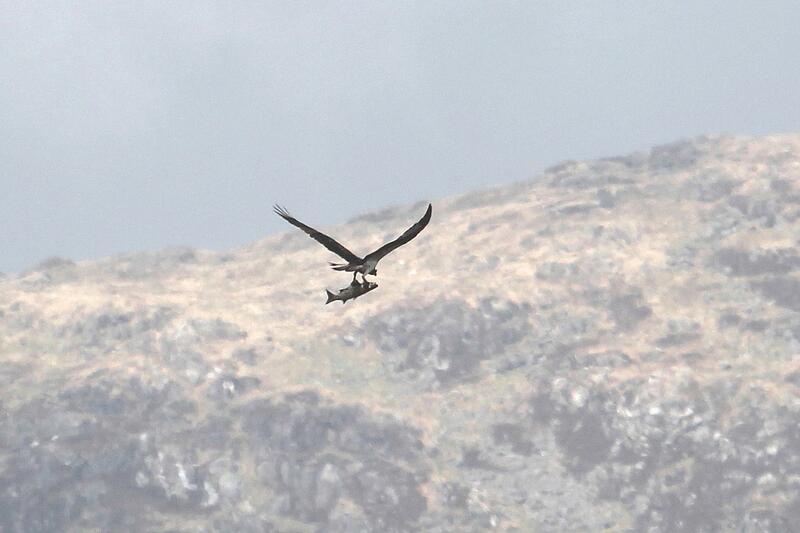 2013 was a year of change for the Glaslyn Ospreys. 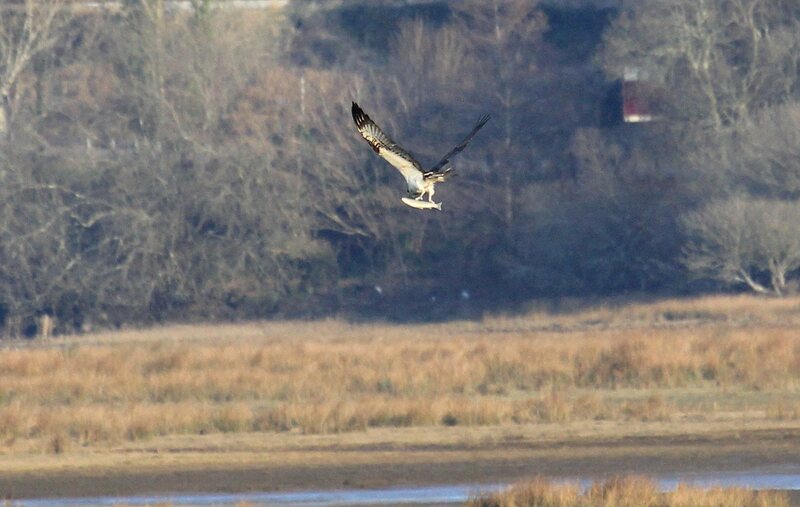 Having taken the lead role in the running of the project since the ospreys were first discovered breeding in the valley, the RSPB would be handing the project over to the local community to run at the end of the breeding season. Volunteers from Bywyd Gwyllt Glaslyn Wildlife worked alongside the RSPB throughout the season to ensure the handover went as smoothly as possible. The ospreys were none-the-wiser of all the plans that were being made regarding their future. On March 24th for the first time both the male and female returned to the nest site on the same day, within two hours of one another. It was their latest return date since 2008, despite this they were still one of the earliest osprey pairs back at a breeding site in the UK. The female was seen to bring her own fish back to the nest on 26th March, which is unusual for her as once they have returned the male has tended to do all the fishing duties until after the chicks have fledged. It did not seem to have any effect upon the bonding of the pair however, as on 6th April, just 13 days after their return, the first egg was laid. This was quickly followed by two more eggs on the 9th and 12th April. The long vigil of 24 hour nest protection began as soon as the first egg was laid and 37 days later on 13th May the first chick hatched from its egg. Two days later the second chick hatched and everyone eagerly awaited the arrival of a third chick. However, for the first time since 2005 only two of the eggs hatched. Unfortunately the egg had vanished into the depths of the nest by the time the tree climber went up to collect the two chicks for ringing, so the reasons for the failure of the egg were not established. There was a considerable amount of disturbance from crows nesting nearby and it is possible this had a contributing factor. The two chicks were well provided for by the male, who once again was seen offering them food this year. The text books used to tell us that only females feed the chicks, but the advent of webcams has dispelled this theory. On 18th June the chicks were brought down from the nest for ringing. They were sexed as two females, the eldest Blue 5C and the younger chick Blue 6C. 5C fledged at 54 days old on 6th July followed by 6C one day later at 53 days old. 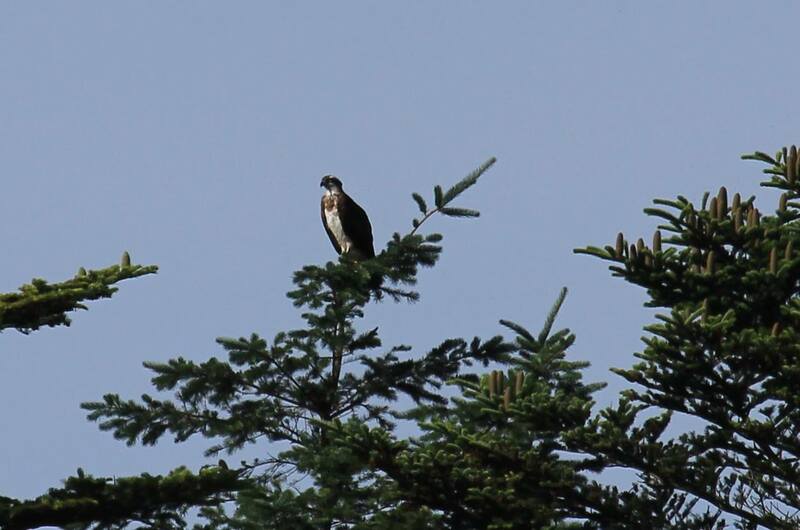 They remained around the nest site for several weeks with the last osprey being seen from Pont Croesor on 27th August, it was not possible to identify positively which osprey was seen. The last confirmed sightings of the two youngsters were of 6C on 22nd August and 5C on 24th August when she was seen to return to the nest territory with a small, but complete fish. Away from the Glaslyn there was more exciting news this year. The second Snowdonia pair bred once again raising two female chicks. They were fitted with blue rings 7R and 8R by Tony Cross. 2006 Glaslyn bred Black 80 returned to his nest at Threave in Dumfries and Galloway and bred successfully for the fifth consecutive year, raising two chicks. His female of the last two years was also recently confirmed as being Blue KC ringed at a Stirlingshire nest in 2009. At the end of March this year White YA the youngest of the 2007 Glaslyn chicks was spotted at Blagdon Lake in Somerset, the first sighting since he left the natal nest. A few days later it was announced that he was believed to be the breeding male from 2012 at Nest 1 in the Kielder Forest. Sure enough after a spell feeding up at Blagdon, where he had more than one encounter under the fish nets there, he turned up at the nest in Kielder and was successful in raising one chick with a new female. Just days after White YA was rediscovered another new development in the saga was unveiled when it turned out that Yellow 37, the eldest of the two Glaslyn 2005 chicks was the breeding male at Nest 2 in the Kielder Forest. It is likely that he was the same male that was seen building a nest with a female osprey in a lone tree on an area of clearfell in 2010. A platform was added to the nest during that winter in the hope the ospreys would return. A pair bred there and raised chicks in 2011 and 2012, when a camera was fitted to the nest. His ring had faded to a very pale yellow and although the 37 had been read, no one linked him to the Glaslyn until the discovery of YA. Yellow 37 returned to Kielder in early April this year and raised three more chicks. Amazingly in July 2013 the youngest of Yellow 37’s chicks from 2011, Blue 38, was photographed on the North Yorkshire Moors, the first grandchild of the Glaslyn pair to be known to have returned to the UK. In November 2013 there was more news from Frederic Bacuez in Senegal, when he spotted Blue 1H, a 2012 offspring of Yellow 37 and his unringed female, in the Todde area of northern Senegal. After several breeding seasons together, the Glaslyn pair certainly have made their mark in the Osprey history books.